It’s baby season in America, September is the busiest month for births on average and has been for at least the last two decades. Which means, it's newborn photo season over here at SweetLife Photography! We all know prepping and planning for a family session can be (eek!) stressful (but pssst, it doesn't have to be, go read my 7 Tips for how to prepare for family photos). But deciding on what your baby should wear for their very first ever photo session has never been easier…keep it simple. While I am sure you have spent months building a dream closet for your baby, as a photographer there is nothing more awkward than having a baby too dressed up for a newborn photo session. 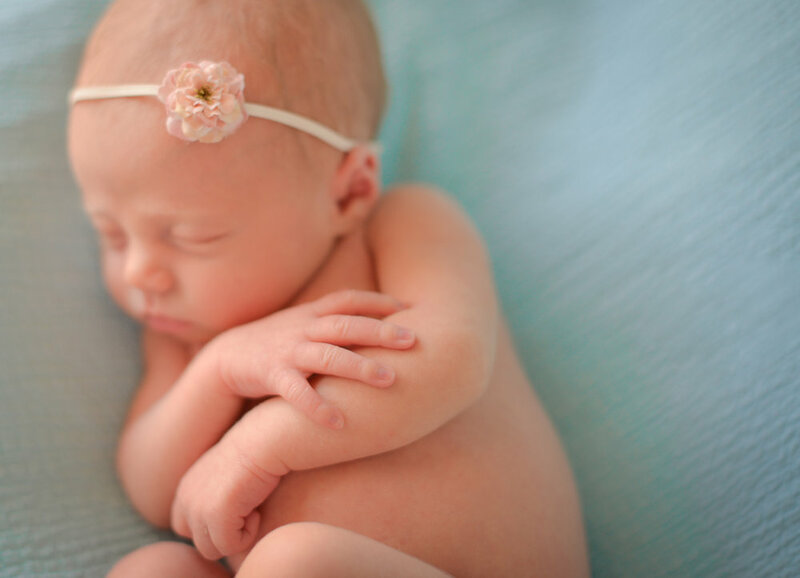 The purpose of newborn photos is to document your newborn and all their tiny features. Even though newborn clothing is so small and cute, it can detract from the purpose of the session and ultimately be very distracting in the final images. So, in honor America's busiest birth month, I'm sharing 5 tips on how to dress your baby for their newborn session. While the first weeks with your newborn can be a little overwhelming, your newborn photo session should be something you look forward to. Your baby will be getting their first professional portraits taken and you will cherish these photos for the rest of your life. While many parents stress about getting everything just right for the session, choosing what your baby wears is super easy. Don’t overthink it, just keep these 5 tips in mind. Save the frilly dresses for girls and collared shirts with suspenders on your boys for a future family session. Even though these items are adorable, they are also high maintenance and will cause you to fuss over straightening collars, pulling down pants that ride up (think Urkle from that 90's sitcom) and straightening dresses throughout the entire session. Fussing over clothing is also very frustrating for your baby, creating a stressful environment during your session will negatively impact your final photos. A basic onesie is the very best outfit for a newborn session and I recommend it to every newborn client I photograph. Yep, it’s that simple. Not only is the onesie easy and low mainenance, but it showcases your newborn’s tiny body. The whole idea of getting newborn portraits taken is to document how tiny they are, so onesies are absolutely perfect for this. 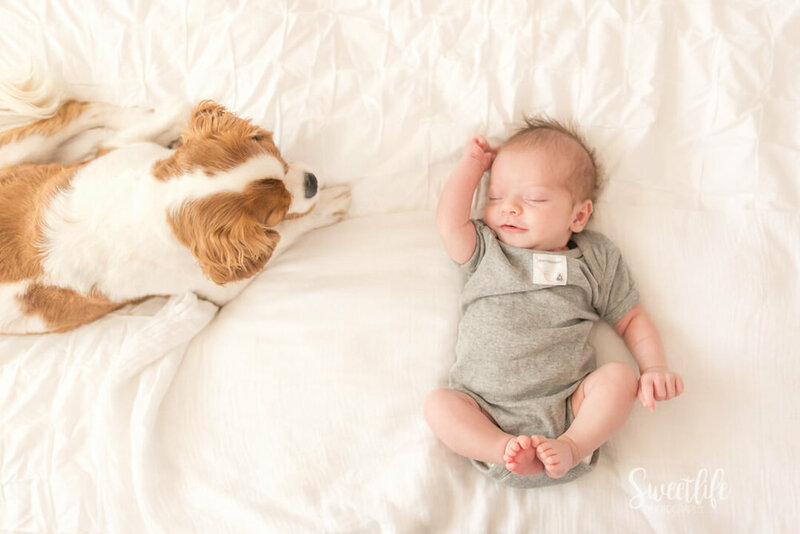 Babies tend to get lost in dresses, jeans, and sweaters so opt for the simple onesie and you will be amazed and how well your baby photographs while wearing it. Prints are something that tend to be a fad, so avoid using them when dressing your baby. When deciding on an outfit, a basic white onesie is something that is classic and timeless. Simplicity won’t make you (or them) cringe in 30 years when you look back on their first portraits. While prints on the baby’s outfit should be avoided, I like to incorporate them in other ways like with a swaddle. The wonderful thing about a printed swaddle is that it can easily be put into or taken out of the photo, without having to undress the baby, which can upset them. If you are a girl mama like me, chances are you love how cute your little one looks in headbands. Baby headbands are the subtle and classic way of dressing up your baby. I always bring along a handful of soft and comfortable headbands for my baby girl clients, many are small and neutral which allows the bow to be a cute detail without detracting from the baby. Don’t even worry about finding a pair of shoes for your baby to wear during their newborn photo session. I will want to take them off. Tiny baby toes are one of the most photographable features to focus on. There is nothing more innocent than bare feet. Save the shoes for their CAKE SMASH session - trust me, it will come soon enough! This goes for both the baby and the parents…keep it neutral. Focus on neutral colors such as whites, creams and grays. Avoid dark colors like black, as it provides such an unflattering contrast compared to newborn skin and doesn’t photograph well. It’s also really important to avoid bright colors in general as they create color casts on the skin. Color casts occur when bright colors are bounced off of neutral surfaces. That rounds out my top 5 tips for dressing your baby for their newborn session. Remember, just keep it simple. It’s all about the baby anyways, right? Got a new baby? I would love to be your newborn photographer! It's never too late for in-home newborn photos! Shoot me an email, let's chat! Be sure to join my exclusive VIP list to receive my latest photography tips and get early access to Limited Time photoshoots. It’s free!